In this card, there is a single mysterious hand that comes out of the clouds. 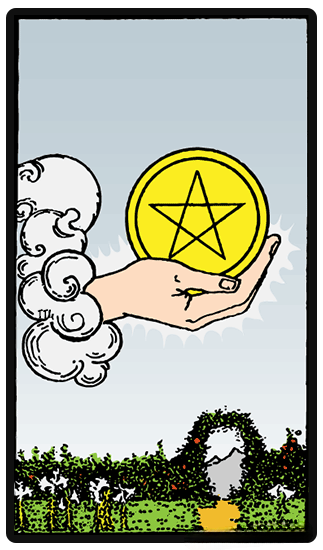 In the hand is what looks like a gold coin with a pentagram engraved on its surface. This pentacle is associated with the element of earth, and seen as a sign of wealth and all things material and earthly. Below the hand is a garden which appears to be flourishing with flowers and other kinds of vegetation - giving off the aura of fertility, growth and prosperity. The mountain represents the ambition required to drive one's search for the pentacle. The flowing creek seem to indicate that emotions are flowing towards this ambition. The Justice tarot card is a symbol of truth, fairness, and law. 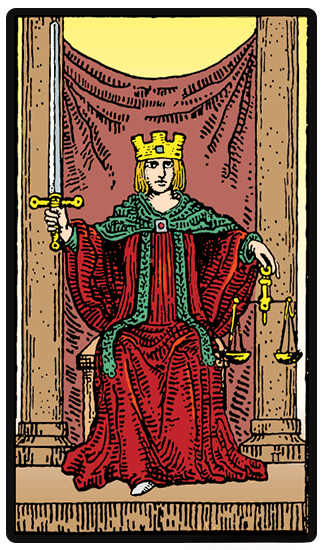 As she sits in her chair, the scales in her left hand represent how intuition should balance logic. She symbolizes impartiality with the double-edged sword in her right hand. The clarity in thought which is required to dispense justice are symbolized by the square on the crown she wears. Behind her, there is a purple cloak and standing grey pillars. Beneath her red cloak, which is held together by a clasp, she shows the tip of a white shoe. This is a spiritual reminder that what she delivers are the outcomes of their actions. clandestine relationship (The Moon may also feature). new work or job but in an area you’re already experienced in, or known to be good at.